Before Jax Teller was Clay’s right-hand man, he was a prospect — the lowest rung on the club’s ladder, tasked with challenges that would test his mettle and shake his resolve to join the SAMCRO way of life. This is that story. Past transgressions return to deliver the Sons of Anarchy a devastating blow. Jax Teller is kidnapped and held for ransom by a pair of dangerous gangsters, and SAMCRO will have to blaze a trail waked in blood and oil to get him back. But will Opie be able to set aside his dream of a life free from the the Sons to save his best friend? 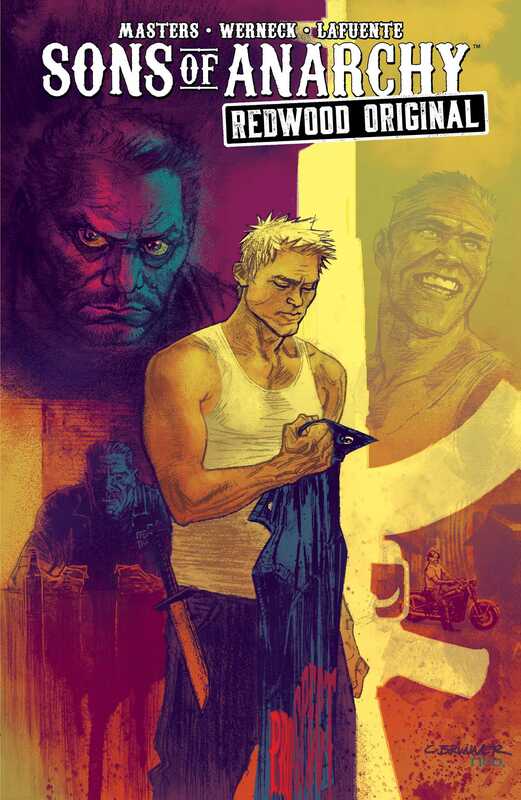 Writer Ollie Masters (Snow Blind, The Kitchen) and artist Lucas Werneck (Saban’s Power Rangers: Aftershock) deliver the stunning conclusion to Jax Teller’s genesis as a Prospect in Kurt Sutter’s critically-acclaimed television series, Sons of Anarchy.